Aaron Gillespie is a man obsessed. Whether he's out in front of The Almost, his new, eagerly anticipated rock-based project, or behind the drum kit for Underoath, the Clearwater, Florida-bred songwriter/musician can't help but throw himself into everything he does. With Southern Weather, The Almost lets Gillespie put a different, more melodic side of himself on display. Hoping to follow in the footsteps of his idol Dave Grohl, who stepped out from behind his drum kit to capture the rock world's hearts as one of the genre's most visible frontmen, Gillespie has begun a metamorphosis. If The Almost brainchild is quick to downplay any similarities to the Foo Fighters in their infancy, his project's debut affirms he's clearly worthy. Consider that The Almost is already confirmed for the upcoming 2007 Warped Tour and that Southern Weathermarks the first time Tooth & Nail has partnered up with a major label (Virgin) for a joint release and there's little denying that Gillespie is about to take the ride of his life. "Aaron is an incredibly talented producer," says Gillespie. "And it turns out we have a lot in common. He wears a lot of hats and plays every instrument. He's able to open up your eyes and make you think about things you can do on an album that maybe you didn't think about." Case in point is "Amazing Because It Is," which started as a very basic song but built into a horn-touched, choir-augmented album pinnacle. "It's way different from anything else on the record, but I think I might like it the best," Gillespie says of the spiritual opus. "It started with one take on the vocals and I kind of kept it stripped down. And then I went to a church-to like a youth group-and they invited all of their affiliated youth groups and I played a few songs for them. And I am so pleased with how it ended up." Nearly as magical is the disc's tender, countrified moment, "Dirty And Left Out"- which took shape after the Aarons spent an evening absorbing Ocean Beachby Red House Painters. If the latter--which counts a guest vocal collaboration with former Sunny Day Real Estate singer Jeremy Enigk--is a noticeable shift from the bone-crunching attack fans have come to expect from Aaron through his work with Underoath, Gillespie says it's completely natural. "As much as I love what I do in that band, there are songs in me and music that I enjoy just as much that comes from melody," The Almost principal explains. While some artists might find themselves overwhelmed by the prospect of working alone, Aaron says he thrived by working on his own with Sprinkle. "I'm used to working in this band environment," he admits. "So that was a shift. But when I hit my stride, I could just go for things. I didn't have to explain what I was looking for to someone else or over-think anything." From the inventive Thursday-meets-Oasis vibe of "Everyone Here Smells Like A Rat" to the breathtaking, undying roar of "I Mostly Copy Other People"--which benefits from the bass and guest vocal work of The Starting Line's Kenny Vasoli --Gillespie plays from the heart on Southern Weather. Throughout the album Aaron incorporates pieces of his youth. Most visible is the disc's commanding opening track and first single, "Say This Sooner," which introduces the album with an attention grabbing, percussion-driven anthem. "I grew up in the Deep South," he says of the urgent, hook-fostered opener. "Like anyone, I've had struggles along the way. But I am very much informed by Southern values and I think the songs speak to that." Just as informed are the Gillespie devotees that scored The Almost the top three songs and #1 artist ranking on PureVolume some four-plus months in advance of Southern Weather's April 3, 2007 release. The first week the songs were up, they received over 100,000 combined plays on PureVolume and MySpace. If Aaron's initial apprehensions about the project being accepted have subsided, it's that honest piece of his personality that is rare for a performer of his magnitude. In advance of an early 2007 tour to test The Almost record on the road with his band--built from a line-up of Jay Vilardi (guitar), Alex Aponte (bass) and Kenny Bozich (drums) and himself--Gillespie was worried about how he'd be received, despite the fact most of the gigs were sell-outs and they all went off with out a hitch, setting the stage for their upcoming Warped Tour commitment. 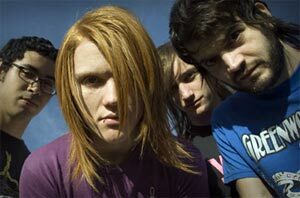 Between his own duties out in front of The Almost and Underoath's touring and recording schedules, Aaron Gillespie is fully committed until 2008. For now, he's a firm believer in his ability to balance both. "Underoath is extremely special to me," he says of the group he co-founded in 1998 which debuted at #2 on the Billboard Album Chart with June 2006's Define The Great Line. "Whereas with Southern Weather, it's got a much broader scope," he continues. "From a 12 year old listening to her iPod on the school bus to a 38-year old guy commuting on a train, I'm excited by the fact that this album can find an audience with a lot of different people."